Rosanna Ienco Barned is an Award-Winning Finalist of the 2010 International Book Awards, 2010 National Indie Excellence Awards, National Best Books 2009 Awards and the best-selling author of 'Awakening the Divine Soul'-Finding your Life Purpose. www.amazon.com She is a Motivational Mentor, Angel Therapy and Reiki practitioner, Master of Crystology and Certified Medium. 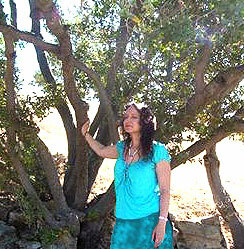 She is also a certified Soul Coach, Past Life Coach and a Shamanic Practitioner. Since childhood, Rosanna was able to connect with the spirit world. Being very sensitive this would often frighten her. It was in her twenties that she finally embraced her gift of strong vision. Her spiritual journey of self discovery had begun, taking her to many exciting places and connecting her to different cultures from all over the world. It was Rosanna’s strong connection to her power animal that changed her life, when she was put in a potentially dangerous situation. Since then she has devoted herself to fulfil her life’s purpose and to help and guide others with their mission. Her strong message is “Keep your Dreams Alive”. Rosanna lives on beautiful Vancouver Island, Canada with her husband Andy and their two sons and daughter. She loves writing, teaching, drumming, dancing, especially belly dancing. Rosanna continues to research her long life interest of mysticism and is pursuing a Ph.D in Philosophy specializing in Mystical Research. May you re-connect with the child within, so that you may remember those Dreams that you have forgotten.